A motley crew of modelling's standout faces are assembled for CR Fashion Book's Fall/Winter 2014 issue in an editorial lensed by photographer Johnny Dufort. Editor-in-Chief Carine Roitfeld corrals a diverse cast of muses, models du jour, and rising stars including the iconic Liya Kebede, Isabeli Fontana, Grace Mahary, Lindsey Wixson, Jacquelyn Jablonski, Imaan Hamman, Xiao Wen Ju, Anya Lyogoshina, Mona Matsuoka, Lida Fox, Valentijn de Hingh, and Neelam Gill. Dufort captures the eclectic beauties in a myriad incarnations with newcomers Anya Lyogishina and Mona Matsuoka playing double-trouble twins, Grace Mahary donning head-to-toe Louis Vuitton and a platinum blonde wig replete with pigtails, Isabeli Fontana roaming the streets with rollers in hair and fluffy slippers for added comfort, and Imaan Hammam hanging out at the laundromat in Prada and a massive afro hairdo. Lida Fox displays stunning flexibility contorting her body into the most unimaginable poses while transgender model Valentijn de Hingh has her tongue planted firmly in cheek posing before an assembly line of frankfurters. 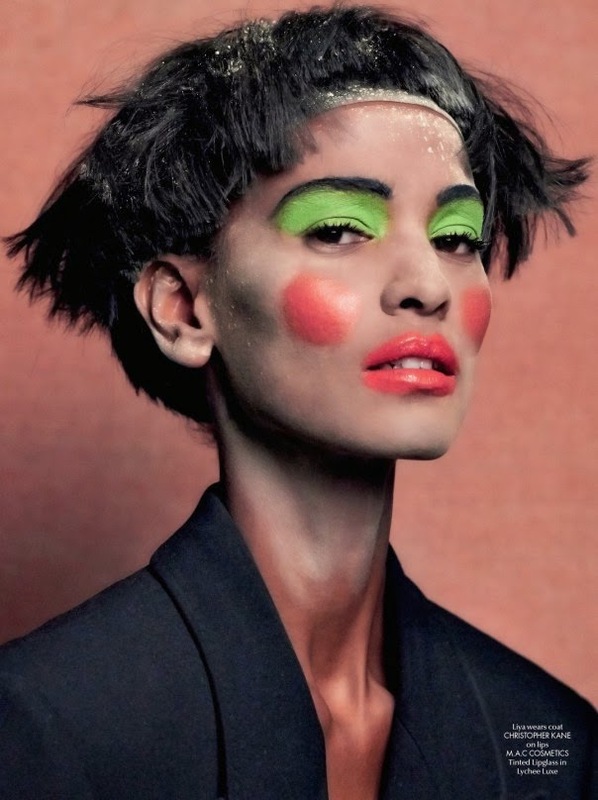 Leave it to Liya Kebede to make garish clown-like make-up and a mop top wig look elegant and sophisticated as only a true super could do.